You are here: Home / Glass Art Bead Club! 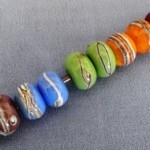 Enjoy gorgeous new glass beads each month! Looking for fun, inspiring, and one of a kind beads? Are you a jewelry artist with a fresh style all your own, but want and need unique beads? Sign up for the Glass Art Bead Club today, and you’ll enjoy the gifts fabulous beads, inspiration and whimsy! Each month, the Glass Art Bead Club delivers beautiful glass beads handcrafted by glass artist Sheri Fisher–right to your door–it may be several earring pairs, an amazing focal and earring pair, or just a complete surprise—like a wine-stopper base and beads to add to it along with some of your own! When you select my fun and easy Glass Art Bead Club, you’ll be receiving amazing glass art beads, handcrafted, one of a kind, and proudly made in the USA! The Glass Art Gift Club is the perfect solution when you truly want fun fresh and unique beads for your amazing designs! Join the Glass Art Bead Club 5 Month Plan and the first month is just $7.00, then $24.00 for the next 4 months, and shipping is always FREE! Join the Glass Art Bead Club Ongoing Plan and the first month is just $7.00, and then $19.00 each month, and shipping is always FREE!